The site Fiverr.com (pronouned “five-er”) has been around for quite a while, but I just recently used it for the first time. The idea is that you can pay someone $5 (or something very cheap) to do a small digital task for you. 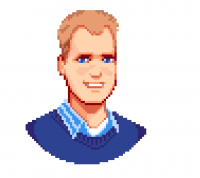 You can peruse it yourself to see all the various offerings, but I wanted a pixel art picture of myself. I’m quite happy with the 8-bit avatar that was drawn for me by user arveyyudi. He even allowed for a minor change to my hair color after he sent me the first copy. I’ve set this as my avatar on a few sites and even in our Outlook directory at work. We have nice standing desks at work. They have electric motors with memory settings so it’s quick and easy to switch between standing up or sitting down. I believe that it’s significantly healthier to stand up at least part of the day, but I find myself being lazy and sitting for most of the day. I also know that it’s relatively easy to motivate myself by measuring whatever I’m trying to improve. Time for a project! To measure whether I’m standing or sitting, I decided to use a distance sensor that either sits on top of the desk and looks at the floor, or sits on the floor and looks up. I’m sure there are cheaper ways to do this, but I ordered a SparkFun BlackBoard, Distance Sensor Breakout, and a Qwiic cable to connect them. There was no soldering required. I plugged it all in and I was good to go. 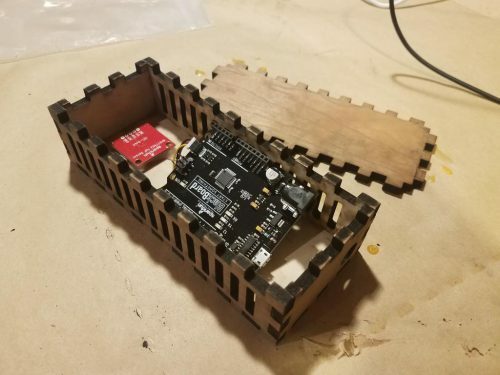 I laser cut a wood box to hold all the components. I wrote a simple program for the Arduino-compatible BlackBoard that would send a measurement when it received a keystroke and then I wrote a program that runs on the computer to periodically request measurements (via USB) and upload them to a database in the cloud. I put a website on top of the page and voila! As I mentioned about a year ago, CrashPlan is closing shop for home users and focusing on the small business market. My contract with them is up in a few months so I did some research to pick a new cloud backup provider. I had about 4TB stored on CrashPlan so a key feature for me was unlimited backup size. I settled on Backblaze. They’ve been around for quite a while and have a feature set that meets my needs and a price that doesn’t break the bank. So now begins the arduous journey of uploading 4TB of data over my Comcast connection. Comcast limits me to 1TB per month with pretty heavy penalties for going over. I normally use 300-400GB/month so it’s going to take quite a while to upload my data again. Comcast provides a web page to view your usage, but I wanted something a little easier to monitor. My router keeps track of my usage and it’s roughly the same as what Comcast says so I wrote an app that grabs the usage numbers from my router every hour and stores them in a database. Now I can quickly check my usage, predict where I’m going to end up, etc. That gives me the info I need to turn my backup on and off to use up as much of that 1TB as possible without going over. I’ve got about 1TB uploaded and I’m happy so far. Their software is ridiculously easy to use and they have a phone app for accessing random files on the go. It’s a good final step in the 3-2-1 backup strategy which means that you should keep 3 copies of your data. 2 are stored locally and 1 is stored remotely. The reading is usually 2-3 hours behind the current time, but the levels don’t usually change too much in a couple hours. 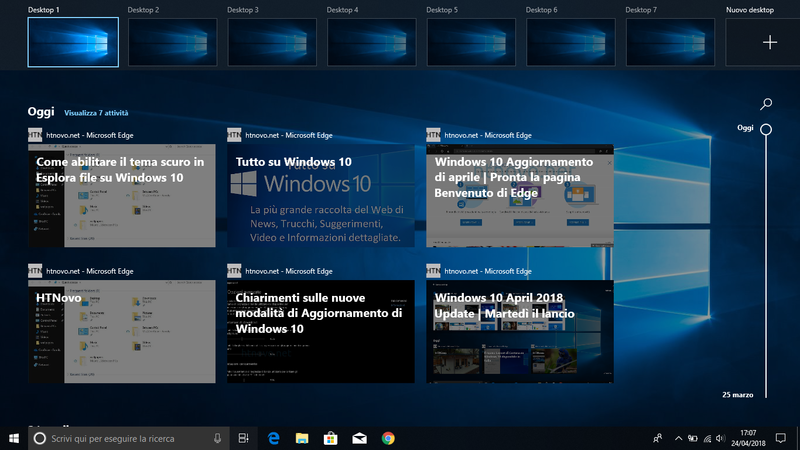 Multiple desktops have been around operating systems for a very long time, but they came to Windows 10 in an easy-to-use feature. I’ve come to really enjoy them and thought I would share how I use the feature in my daily work because I have found that most people don’t know about it. First off, what are multiple desktops? If you’re reading on your computer right now, you might have a collection of windows open. That’s a single desktop. Now imagine if you could switch to a new desktop and have a completely different set of windows open while still making it easy to get back to the old desktop. That’s multiple desktops. There are plenty of tutorials online showing how to set it up and move windows between desktops so I’ll skip that part. The key thing for me is that multiple desktops help me context switch and focus at work. Desktop 1 is for email, IM, Spotify and other communication/peripheral stuff. Then I have a desktop for each task that I’m working on. Since I try to keep multi-tasking to a minimum, this means that ideally I only have one other desktop. Working on this other desktop helps me to stay focused on that activity and not get distracted by email, etc. If someone comes to ask me a question, I can flip to a new desktop, open windows to answer their question and then quickly jump back into the work I was doing. It’s not a perfect solution though. Some apps don’t play nicely with multiple desktops. OneNote is probably the worst offender in my daily workflow. If I already have OneNote open on Desktop 1 and then I try to open it on Desktop 2, it flips me back to Desktop 1 and opens a second copy. Then I have to drag the window to Desktop 2. It’s annoying but not a deal-breaker. It’s an advanced feature that takes a while to get used to, but consider giving it a try for a week or two to see if it fits your workflow. P.S. One usage tip: To quickly flip back and forth once you have multiple desktops going, hold down CTRL+WINDOWS and press the left and right arrows.